Lapointe, Pierre Louis and Claudine Pierre-deschênes. "Shawinigan". The Canadian Encyclopedia, 04 March 2015, Historica Canada. https://www.thecanadianencyclopedia.ca/en/article/shawinigan. Accessed 24 April 2019. After 1825 the government of Lower Canada had the territory of the Mauricie region surveyed. The first concessions were given out in 1831. Shawinigan was first the site of a waterslide (1852) built so that log booms could be sent downstream to Trois-Rivières. Shawinigan, Qué, City, pop 17 535 (2001c), 18 943 A (1996c), 19 931 (1991c), area 28.15 km2, inc 1921, home of the Québec chemical industry, is located 30 km northwest of TROIS-RIVIÈRES on the shores of the Rivière SAINT-MAURICE. The name derives from an Algonquin word, meaning &QUOT;portage on the crest&QUOT; used to avoid the area's major waterfalls. After 1825 the government of Lower Canada had the territory of the Mauricie region surveyed. The first concessions were given out in 1831. 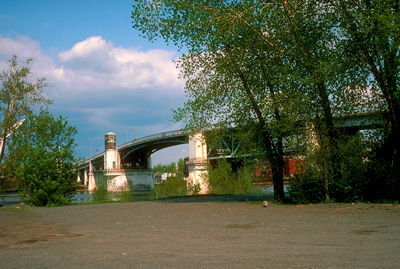 Shawinigan was first the site of a waterslide (1852) built so that log booms could be sent downstream to Trois-Rivières. From 1843 to 1883 the region's very sparse population spread a little south of Shawinigan to the Grès sawmill. Shawinigan was born of the desire to exploit the hydroelectric potential of the falls. In 1899, after an extension of the Great North Railway line, Shawinigan Water & Power (SWP) built a dam and organized the development of the settlement, which then grew rapidly. Several industries, attracted by the available electricity, moved there: in 1900, Belgo-Canadian Pulp (since 1967, Consolidated-Bathurst); in 1901, Pittsburg Reduction (Alcan); and in 1903, the Carbure Company of Shawinigan (Shawinigan Chemicals). SWP began providing electricity for Montréal in 1903, but the power soon stimulated Shawinigan's own growth. The great industrial development of the early 20th century, based on paper, aluminum and chemicals, continued with the arrival of Prest-O-Lite in 1907, Shawinigan Cotton in 1909 and Canadian Industries Ltd in 1931. After the Great Depression of the 1930s the economy began picking up again in 1940. In 1963 HYDRO-QUÉBEC took over the SWP installations. Since the 1960s there has been a marked decline in the city's economy: the old industries have reduced or ceased activity and no significant new employer has arrived. Today the economy is based on metal and mineral processing and the petrochemical industry. A theme park, City of Energy, is devoted to the history of hydroelectric power and to the chemical, aluminum and forest-products industries that led to the development of what was once called the &QUOT;Niagara of the East.&QUOT; A 100 m high observation tower overlooks the park and the river valley. Promenade St-Maurice runs along the river, connecting some of the city's parks. Parc des chutes de Shawinigan, which lies between Shawinigan and Shawinigan-Sud, features the largest (at 46 m) of the numerous waterfalls in the area. The Shawinigan Arts Centre contains a concert hall and 2 exhibition galleries, which host showings of local, provincial and national artists. Shawinigan is the birthplace of Jean CHRÉTIEN, prime minister of Canada.